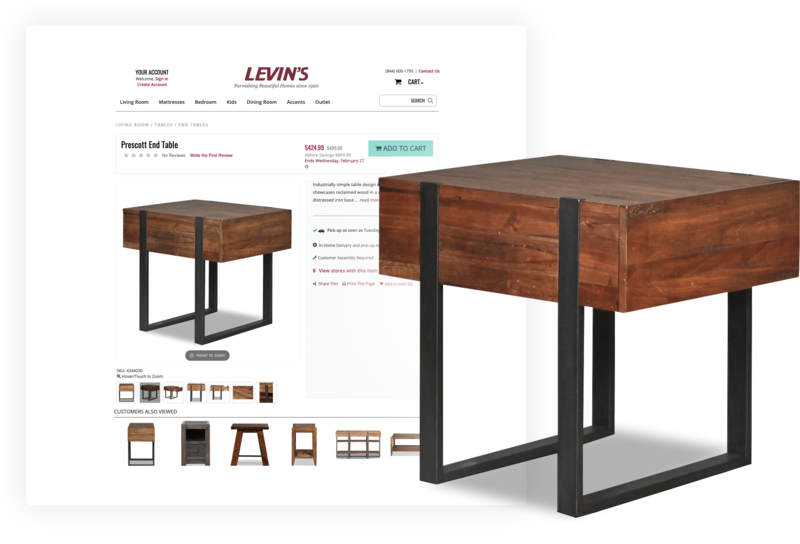 Run your website on the best ecommerce platform for furniture retail. 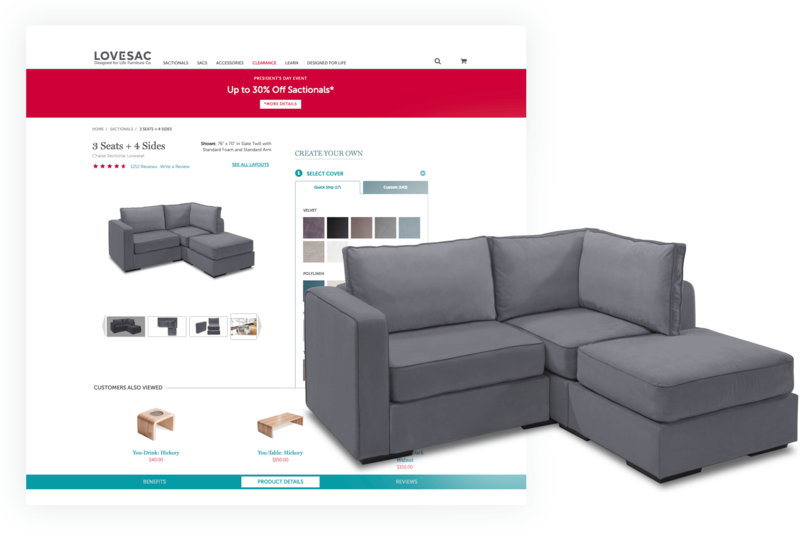 Our ecommerce platform is built for furniture retail, ensuring a fast and efficient launch of your best-in-class website, seamlessly integrated with your systems and completely in sync with your business. You’ll get a customized online store on Blueport’s powerful ecommerce platform – including a web experience that enhances your unique brand, with all of the features and tools needed to grow your business, fully integrated with your ERP system. You’ll get the best industry-tested ecommerce features that engage and convert furniture shoppers – advanced product search and promotional capabilities, personalized product recommendations, advanced segmentation, easy product configuration and the marketing, merchandising and analytics tools to make it all work. You’ll enjoy seamless ecommerce as your online checkout precisely mirrors your existing business processes. Fully integrated with the systems you’ve already built for delivery, store pickup, warranties, financing and customer service, your online order process will generate profitable, easy to fulfill online orders. Our mobile-optimized platform ensures your website engages shoppers wherever and whenever they shop, driving results online and in your stores. Responsive mobile technology ensures your website looks great and works works well on any device – desktop, laptop, phone or tablet. With a single application that self-optimizes for any device, customers can engage with your brand anywhere at any time. Local optimization technology automatically locates your shopper, identifies their closest store and adjusts your website to ensure they see the same locally-available products, prices, promotions, policies and delivery options online as they will in-store. Our platform includes patented tools that allow your Salespeople to participate in omnichannel selling. And, salespeople are credited when they help shoppers along the way. Blueport continuously provides new furniture features on a secure, stable Cloud platform that saves you the cost, risk and headaches of developing and hosting your own website. Running your website on a cloud platform means you get a continual stream of enhancements and new features, all included with your Blueport platform, providing your shoppers with the best possible experience on the day you launch and every day thereafter. Blueport’s Cloud infrastructure ensures your customers can access your website with lightning speed. With 24/7 monitoring and support, you can rest easy knowing that your website is in good hands, all at a significantly lower cost than hosting it yourself. Top-tier security protects your business and your customer information, taking advantage of the latest innovations in the increasingly complex world of retail data protection. We source, customize and integrate leading ecommerce plugins, giving access to these top technology partners on day one at no additional cost. Just like a brick and mortar store, it’s how your run your online store that makes all the difference. Our experts in online furniture can help. The Blueport Platform comes with furniture ecommerce expertise and technical support to ensure you get the most from your new website. 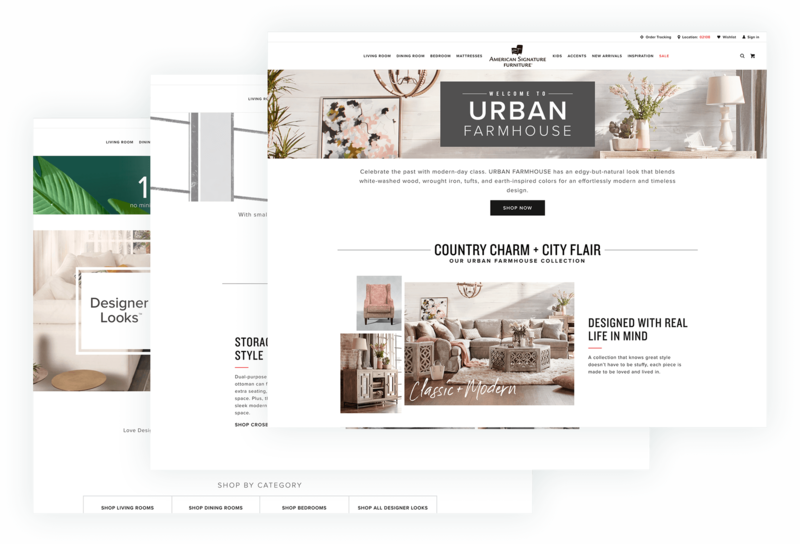 With 96 stores in the Midwest and a 60-year history of furnishing America’s homes, Value City Furniture selected Blueport Commerce as their ecommerce partner of record after an exhaustive search of ecommerce options. 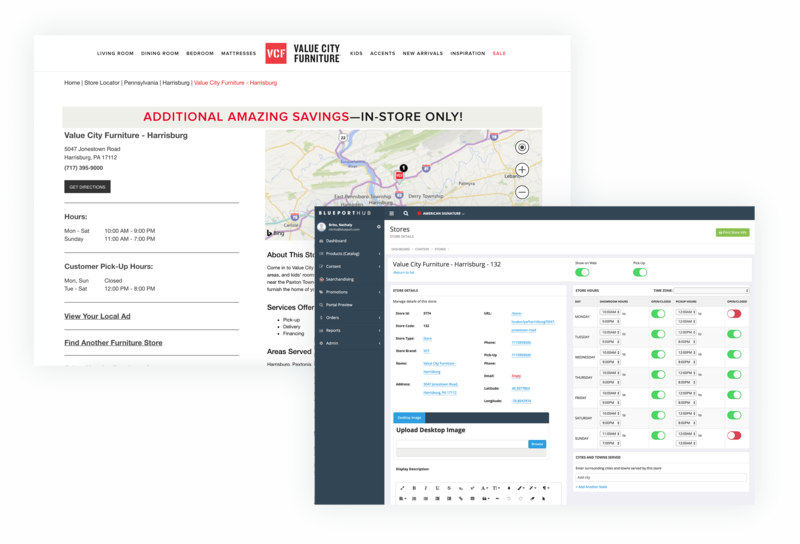 Value City implemented the Blueport Platform taking full advantage of the platform’s geolocation and segmentation capabilities, customizing marketing, pricing and merchandising geographically across the chain’s wide variety of stores. Coupled with Blueport’s Store-Sync technology, geolocation enables Value City to offer shoppers a personalized, local shopping experience, with digital efforts synchronized with local stores and salespeople. 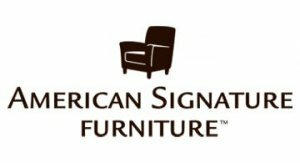 With 28 stores along the Eastern seaboard, American Signature Furniture uses the Blueport platform to enable ecommerce and offer shoppers a seamless omnichannel experience. Easy Pass, powered by Blueport’s patented Store-Sync technology, ties stores, salespeople and the digital experience together, providing shoppers with an easy, informed path to purchase. Taking the channel conflict out of digital commerce, Blueport has helped American Signature implement a truly consumer-centric shopping experience.